Borch Solar Panel Charger Cell..
Grade A cell, Build-in 5000mAh Lithium Polymer battery which charges via a powerful 1.2W monocrystalline solar panel ; 2.1A output allows for simultaneous charging of your devices at high speed ;Anti-explosion, lightweight, compact and reliable. The LED flashlight works perfectly in darkness, especially for emergency. Just press the button twice, the LED will light up; 4 LED status of charge indicators indicate the charging and discharging process. Compact, portable & stylish design; Easily fits into your bag to provide instant power; Football grain design has anti-skid protecting effect ; Perfect for long flights, road trips, hiking, camping, beach or whenever you need to charge your mobile devices wherever you are. Package includes: Borch 1xSolstar External Battery, hook, micro USB cable, instruction manual Shockproof, Dustproof & Rainproof portable solar charger on the planet; Solar energy technology, environmental friendly and could recharge itself under sunshine for emergency purpose when outside; Borch Solar Panel Charger can charger your phone about 50% to 60% juice for emergency after being solar charged for 7 to 8hrs under normal sunlight, It's not easy for 1.2W input Solar panel to fully charge the buit-in battery with sunlight, thus, we suggest it for casual use,For long trip,hiking, Borch Solar Panel Charger would be a perfect choice. . Water resistant design ensures the device functions smoothly when it's raining; Shock-proof feature ensures the device working properly even it crashes or drops. 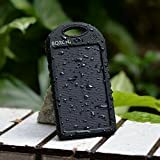 Portable design Compact size design for portability, with the free hook, you may just hang it on your bag pack when outdoors, easy to carry and charge, Rain/Dirt/Shockproof feature protects the device from damaging. Specifications: Battery Capacity : 5000mAh Li-Polymer Battery Input: 5V/1A Output: 5V/2X1A Product Dimension: 142*75*13.6mm Product Weight:143g Solar Panel: 5.5V,200mA AC charging time: about 6 hours Note: When charging the solar charger via the solar panel, please avoid prolonged exposure under the burning Sun. The solar charger is waterproof but should never be immersed in water or any other liquid. Do not throw the solar charger into the fire.